Prosciutto and figs – what a deliciously Italian combination! 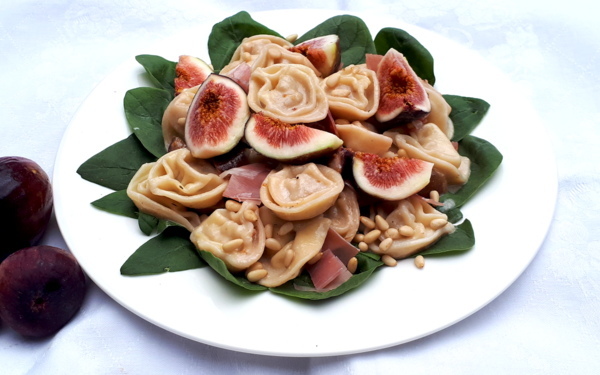 Fresh figs aret he heroes in our lusciously creamy sauce for our Prosciutto Tortelloni! Add a splash of olive oil and a little butter to a pan and add about eight fresh figs, cut into quarters. Season with salt and pepper, add 300ml of cream and the juice of a small lemon as well as a couple of sprigs of fresh thyme. Simmer until the figs fall apart and the sauce thickens. In the meantime cook one packet of Bacci’s Fresh Gourmet Prosciutto Tortelloni for 12-15 min and reserve some of the pasta water. Add a splash of the pasta water to the sauce and once cooked and drained, the tortelloni straight from the pot into the pan with the creamy sauce. Mix and serve on a bed of fresh spinach leaves, top with bits of prosciutto, pine nuts and more fresh fig quarters, which will look stunning. Prepare your taste buds for a flavour sensation!